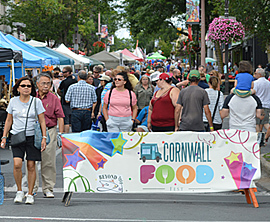 Cornwall Ontario – The Downtown District will once again be taken over by Cornwall’s biggest and tastiest street party of the season. 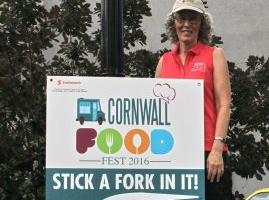 Cornwall Food fest is hitting Pitt Street on August 19th and invites all the foodies to come out and satisfy their taste buds. For only a two dollar admission fee, people can enjoy food, artisans, shopping and fun! Bringing the community together, the festival gives everyone a chance to celebrate what the city has to offer. The event is hosted by Beyond 21, an organization that works with adults with developmental disabilities and was named an Ontario 150 Community Celebration Event. Come out and enjoy all that is offered between 10:00 am and 8:00 pm! With 13 food vendors participating, festivalgoers will be offered both hometown favorites and new, exotic flavours to try. 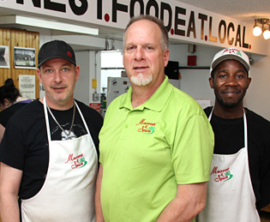 From local eateries like Sheep’s Head Bistro and Thum’s Kitchen Thai Cuisine, to food trucks like Beavertails and Big D’s Dog House & Poutine Emporium, Food Fest offers tantalizing eats for everyone to enjoy. The sounds of live music will serve as the backdrop for the festival as local musicians are featured in the Entertainment Tent on Pitt Street near Fantasy Realm and Kings and Little Ones. Live music will be starting at 11:00 am and closing the festival at 8:00 pm. 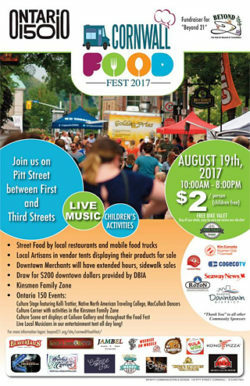 There also a list of different performers taking the Ontario 150 Culture Stage, located at Pitt and First Street. There are also different performers such as Kelli Trottier and Nicolas Doyon taking the Ontario 150 Culture Stage, located at Pitt and First Street between 10:00 am and 7:30 pm. Besides the great food and exciting live performances, this year’s Food Fest features the Kinsmen Family Zone at Pommier Square where there will be free family activities such as face painting, giant Jenga and arts & crafts. There will also be downtown merchants and artists running sidewalk sales, appearences from magician David Jans, and the chance to win $200 downtown dollars brought to you by local Pitt Street stores. This year, for second time, Cornwall Food Fest will be partnering with CoTiCon, and for the first time ever, the Kinsmen In Motion Show & Shine car show. CoTICon is Cornwall’s full-day convention for anime, comic and geek culture enthusiasts at Lamoureux park and will include a parade of costumed individuals going through Food Fest at 11:00 am. 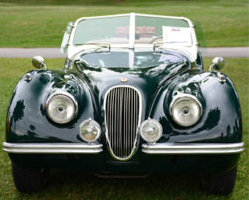 The Kinsmen In Motion Show & Shine is a car show is taking place at the bottom of Pitt Street and is a showcase of the most vintage vehicles in the Cornwall area.